Integrated Skills Ltd (ISL) work with Bee’ah Waste Management to create optimised routes in their environmental services operation, Abu Dhabi. Abu Dhabi is the capital of the United Arab Emirates (UAE), and the second most populace after Dubai with a population of 1.5M (2014). The city of Abu Dhabi is located on the north eastern part of the Persian Gulf in the Arabian Peninsula. It is on an island less than 250 metres from the mainland. ISL (www.integrated-skills.com) has worked closely with leading regional waste management contractor, Bee’ah (www.beeah.ae) to develop optimised routes for a new contract for waste collection and street sweeping services in Abu Dhabi. Bee’ah, which is the awardwinning environmental management company in the UAE, contracted ISL to carry out comprehensive route optimisation as part of its contract mobilisation. ISL’s key tasks and responsibilities included data preparation, high level and detailed route optimisation, and production of outputs including data for in-cab devices. ISL utilises the RouteSmart for ArcGIS™ software solution from RouteSmart Technologies (www.routesmart.com) to carry out route optimisation projects. Based on the World leading ArcGIS technology from ESRI (www.esri.com), RouteSmart for ArcGIS is ideally suited to produce detailed optimised routes for high density service operations, such as waste & recycling collections, street sweeping, gully emptying, snow ploughing, gritting/salting and related environmental services. According to Matt Polson, ISL’s International Projects Director, “This project represents another significant step for ISL as it builds its client base in the region”. He continues, “Starting in Bahrain over 7 years ago, ISL now has software and software consultancy clients operating in the Lebanon, UAE, Oman and Palestine, and we are working with prospects in Kuwait and Qatar.” The contract for the software solution in Bahrain has been extended, he added. ISL has produced a number of GIS software solutions to compliment RouteSmart for ArcGIS including a job/asset/contract management system called Performance Manager, a specialised in-cab device for navigation along optimised routes named Navigator as well as a range of smartphone apps. Bee’ah is an integrated environment and waste management company, founded in 2007 and headquartered in the Emirate of Sharjah. Bee’ah touches and transforms thoughts, attitudes and behaviours in individuals, communities and businesses enabling them to lead positive sustainable growth by providing the infrastructure, tools, facilities and initiatives to turn waste materials into resources (www.beeah.ae). Integrated Skills Limited, operating internationally out of Romsey near Southampton in the UK, is a specialist provider of GIS based software solutions including contractor management systems, routing and optimisation software solutions and street works coordination software as well as environmental consultancy. ISL is a partner of RouteSmart Technologies Inc.™ (www.routesmart.com) for high density, door-by-door and street-by-street route optimisation software as used by local authorities and their contractors for waste & recycling services, winter maintenance, street cleansing, gully emptying, grounds maintenance, social care transportation and similar services. 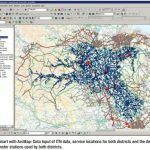 The “RouteSmart for ArcGIS” software is also used in the postal services, newspaper distribution and utilities sectors. “Navigator” is an in-vehicle solution that enables drivers to navigate along optimised routes and over customised travel networks. The solution provides visual and audible turn-by-turn directions as well as hazard warnings. The reporting functionality enables the drivers to reports issues along the route. “Performance Manager” from ISL was wholly developed by the company providing an externally hosted software solution for the management of contractors in the environmental service sector. “Trafficworx” manages the coordination of road works providing stakeholders with transparency on all planned and projected road works enabling them to propose, accept/reject and progress road works.